*Please note, a laptop or electronic device with Microsoft Excel is required. Course information will be provided on a flash drive with work to be completed in Minitab and Excel. Do not activate the Minitab free trial prior to the course as this will allow you to use Minitab throughout the training. ers a mastery level of techniques to lead projects and mentor Lean Six Sigma Green Belts. 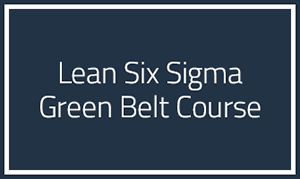 Lean Six Sigma Green Belt training will introduce you to the Lean Six Sigma philosophy and terminology and give you the tools you need to complete your Green Belt certification project. This course uses a combination of lectures, presentations and hands-on lab exercises to provide you with a strong foundation in Lean Six Sigma. You will gain the skills needed to lead Lean Six Sigma process improvement projects, work on teams led by Lean Six Sigma Black Belts and help your organization implement Lean Six Sigma effectively. This two-week course comprises the entire Green Belt training program, and serves as the first two weeks of Black Belt training. This format allows Green Belts and Black Belts to train together, creating atmosphere similar to the work environment, where Green and Black Belts work together on Lean Six Sigma project teams. Trainees are to have a Lean Six Sigma project prior to attending class. A certificate will be awarded to each person who completes the training and passes the test given on the last day of the course. Certification requires the completion of a project which takes place in your company.